The precise moment at which Rebellion turns us against ourselves is about a fourth of the way through the film. Up until that point, it has depicted the happy world that, as any viewer with a trace of empathy must concede, the characters have more than earned. Throughout the series, we followed these young women, suffered with them, hoped against hope that they would be able to find some form of happiness. In the end of the series, arguably, they did, but there is little denying that the ending to the series is bittersweet. Homura is alone, the only one who remembers Madoka. Madoka is gone forever, never born to begin with. The rest of the magical girls still fight, still suffer, still sink into the uttermost depths of despair to become witches–but are mercy-killed by Madoka just as they do. Sayaka still died for a boy who barely noticed she was there. Mami and Kyoko are active as magical girls, so we can presum Mami’s parents are still dead and Kyoko’s family still perished in a murder-suicide. The end of the series was an honest ending, not a happy one. It depicted the creation of a new, better world, but far from a flawless one. That flawless world is what we see in the first segment of Rebellion. All five magical girls are alive and working as a team. Their interpersonal difficulties are reduced to flirtatious teasing between Sayaka and Kyoko. The psychic damage of Homura’s time-travel shenanigans seems healed: Homura is back to her shyer, less confident, but more pleasant and cheerful glasses-wearing pigtailed self, and Madoka is both more cheerful and more confident, more like the version Homura first met at the beginning of Episode 10. The Nightmares are almost laughable as a threat. If Hitomi’s Nightmare is anything to go by, they pose no physical threat to the girls, don’t torture them psychologically, and can be reduced to literal moe-blobs. What’s more, they release a massive abundance of Soul Gem-cleansing light when killed, which as I’ve noted before not only permits, but encourages, the girls to work together, and in addition provides more than enough energy to keep them from blackening their Soul Gems and dying. Instead, the girls get to be magically powerful and visually impressive, fighting as a team against jus enough difficulty to feel useful without ever experiencing the horrors of the series. This is what we, collectively, as an audience, wanted. Oh, most of us understood that the ending as it stood was probably aesthetically better, but enough fanfiction by those too inexperienced to know better or too invested to care exists to make it clear: we wanted better for these girls. And here the movie comes, and gives us exactly what we asked for–until Homura starts to figure it out. Like Paradise Lost before it, the show tricks us into rooting for someone who is trying to destroy our paradise. Homura knows this happy world is untrue, and therefore we know that by investigating it she will destroy it. From her initial conversation with Kyoko, the world becomes less and less realistic, until by the time the two realize they are trapped in the city the world is an abstraction of red field and white lines, the bus the only recognizable object. Soon after, Homura becomes the familiar glasses-less, straight-haired, darkly stoic girl we remember from the series, and the familiar site excites us even as it means the happy world is deteriorating still faster. Soon after, we see the battle teased throughout the first three episodes of the series, as Mami and Homura come to blows. The resulting battle is visually stunning, as Homura and Mami both employ their respective powers and extensive arsenals to the fullest. It is exciting, dramatic, well-animated and scored–and horribly, horribly wrong. As a set piece, it is a long sequence that advances the plot little, the characters and themes not at all; it is exciting, but blatantly gratuitous, a pure piece of audience pandering of the sort the show deliberately shied away from most of the time. And then Homura shoots herself in the head, and Mami dissolves into ribbons, the pandering turned suddenly to horror. Getting what we want is a disappointment and leads to horror. 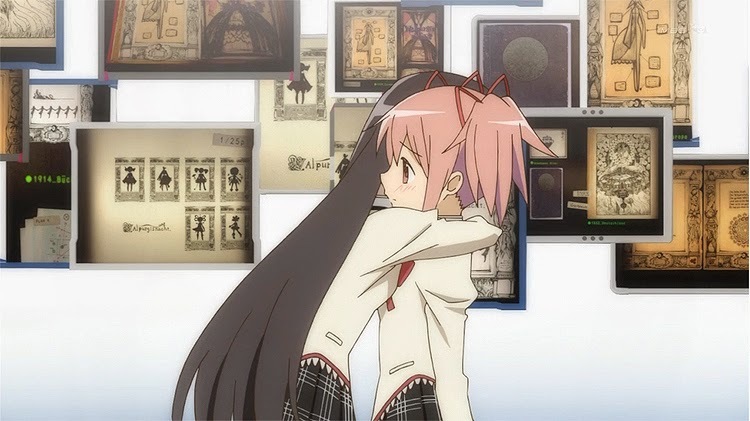 Nowhere is this as clear as in the film’s climax, when Homura and Madoka are reunited and it all goes horribly wrong, resulting in a world where all the girls are free and alive and Madoka doesn’t have to be a magical girl–a corrupt world ruled by a demonic demiurgic Homura who is holding Madoka prisoner. We bought our tickets, sealed our contracts, and got our wishes, and they turned to ashes around us. Desire leads inevitably to suffering. Why? Because we might wish for happiness, but we need truth. This is not to say that despair is truer than happiness, but rather that the truth of Madoka is entropy and the inevitability of decay, and the series ha consistently equated physical entropy and decay to the feelings of depression and despair. To end straightforwardly, uncomplicatedly happily, to give us what we wish for without corrupting it or snatching it away is to deny itself. So the film forces us to reject our own desires for the series. Those who revel in its darkness and spiky difficulty must endure being pandered to with fanservice, pushing them to deny their own fandom. Those who embrace the fanservice must face where it leads. Both must deal with the deeply ambiguous final arc of the film, as Homura creates a world simultaneously darker and brighter than the world of the series, yet more coherent than the dream-world of the film. Thus, the series places the viewer into the position of the magical girls. Pursuing our desires for the series leads to it becoming tragic. Our wishes transform into curses as down the spiral we go, until we find ourselves, at the climax of the film, wishing for Homura the witch to tear apart the world–and then when she does, we must live with the reality created by that wish. By turning us against ourselves, and showing how our wishes for the series betray us, the film makes one last effort to push empathy onto us. Like the series in its first few episodes, it offers spectacle and fanservice to draw us in, and then, once the trap is baited, it makes us feel for the characters. Even more so, however, it makes us feel as the characters–empathy as opposed to sympathy–by placing us into a situation analogous to theirs. That moment of confusion, of alienation, of wrongness when Homura pulls Madoka apart? That is a small taste of what it feels like to be a magical girl. I said above that this is a series about entropy and decay, depression and despair, and it is. But it’s easy to forget that it’s about other things, too, and by turning us against ourselves it reminds us of those other things. This isn’t just about Buddhism, or German literature, or the magical girl genre. It isn’t just about entropy and suffering, or just about thematic complexity or the possible psychological issues of its implied, gestalt author. It isn’t even just about characters, blobs of light and color created by animators and voiced by actors. It’s also about us. In the end, as in the beginning, Puella Magi Madoka Magica is a story about people. There is a recurring image throughout the Madoka Magica movies, one we have briefly mentioned before: a rather sweet tableau of two white chairs on a grassy hill, Madoka and Homura sitting side-by-side in them. In the opening credits of the first two movies, they cuddle, sweet and adorable, and innocent. In the third movie, the image turns rapidly rather less sweet. As she goes through the process of becoming a witch at the climax of the second arc of Rebellion, Homura returns to the chair scene. But this time, Madoka stands and casts herself sideways off the chair, splattering into a pink stain on the grass while Homura reaches for her helplessly. Homura crouches beside her, eyes wide in shock and horror, while a crowd of tall, attenuated Homuras surround her, gazing down. And then the vast fist of a raging Homura smashes the crouching Homura, railing and weeping beside the remains of Madoka. Madoka is gone, her coherent identity replaced by a diffuse abstraction. Homura failed. Now Homura stands in judgment over Homura, and finds her wanting. Her rage and grief at last unleashed, she smashes her own identity to become an abstract and esoteric being herself: a witch. Just like Sayaka, and presumably every other witch, before her, Homura’s witch form is an endless cycle of self-flagellation, a psychodrama in which she acts out the events that brought her to despair and punishes herself for her failures. She tries to shoot herself, and the self she shoots becomes the Madoka she had to mercy-kill. She cannot die, does not deserve to die, the way that Madoka did, because she has failed to save Madoka. Not only failed to save her; Homura is the reason Madoka is gone. Her looping through time empowered Madoka to become the Law of Cycles, which erased Madoka from reality. Her discussion of Madoka with Kyubey gave the Incubators the information they needed to construct the trap now closing on Madoka–and they used Homura to create that trap. Homura is Madoka’s greatest liability. Homura’s witch form is among the most literal. She has the peaked black hat, the prominent nose and chin–other than being a skeleton hundreds of feet tall, she looks rather like the standard Halloween costume of a witch. Homura knew about witches and where they come from, and yet she still failed to avoid that trap, even embraced it deliberately in a bid to foil Kyubey. Unlike Sayaka, who believed herself a knight and so still looked like one as a witch, Homura knows what she is choosing to become. Likewise, she is deliberately sacrificing herself, as she tells Kyubey: she trusts Mami and Kyoko to kill her. Thus her familiars lead her to the guillotine, the mechanism of her sacrifice and instrument of judgment for her crime. At the same time, she is surrounded by imagery related to the nutcracker. One type of her familiars is giant teeth with nutcracker jaws. Another resembles toy soldiers, but with their high fur hats resemble the traditional Christmas nutcracker as well. An image of a grinning mouth clenching a walnut in its teeth appears when she first starts to realize that she is the witch in whose labyrinth the magical girls are trapped. And she loses half her head, leaving only the lower jaw–a mirror of the titular nutcracker of E.T.A. Hoffman’s story and Tchaikovsky’s famous ballet based on it, who lost his lower jaw. The doll-like appearance of many of her familiars and prominence of clockwork also recall the original story of “The Nutcracker,” in which the Nutcracker led an army of dolls from a clockwork castle. At a basic level, the image of a nutcracker without a jaw is an image of uselessness, an object without purpose. There is a deeper resonance here, however, if one recalls the tale-within-a-tale of the origin of the nutcracker in Hoffman’s story. The nutcracker was once the chosen one, described in prophecy as the only one who could rescue a princess cursed by the Mouse Queen. He had to perform a complex ritual to save her, but just as he completed it, he tripped over the Mouse Queen, and so the curse fell on him instead. This is Homura, relaxing because she believed she had helped Madoka escape her fate, only to discover that she’d failed in the end because of the intervention of that little rat Kyubey. It is, in other words, yet another way to blame and punish herself. But the magical girls refuse to cooperate. They refuse to join Homura in judging her. They refuse to hate her and refuse to kill her. Instead, they work to free her, break the labyrinth and the Incubators’ trap so that Madoka can take her off to magical girl heaven. Despite her raving and her pleading, they insist on forgiving her. They reject Homura’s judgment, and demand that she reject it as well. They want her to forgive herself and free herself. But Homura has been fighting Homura from the start of the movie. Throughout the first arc of the film, Homura seeks the mysterious and invisible tyrant who rules the seemingly happy world in which the magical girls find themselves, with the intent of destroying it. It is the discovery that she is that tyrant which leads her to call down a curse on herself and transform fully into a witch; all of this is part of her rebellion against herself. That rebellion has not ended by the end of the film. Homura describes herself as evil and embraces the role of the scantily clad, black-winged devil-woman. But what difference is there between saying “I am evil” and “I deserve to be punished?” This is simply another expression of her guilt, a new way of tormenting herself. She has elevated herself to a cosmic being, a demiurgic entity who appears to have near-unlimited powers over material reality and the people in it: she can rewrite Sayaka’s memories, bring back the dead, construct an entire new history for Madoka’s family in order to reverse the first episode. And yet she chooses to make a world where she is alone, isolated from the friendships she was starting to build with the other magical girls. She chooses to let Sayaka tell her off before the memory erasure. It could have ended. If the other magical girls had simply killed her, she would be beyond further punishment, and her suffering would have ended. But they, in their cruel mercy, forced her to go on, forced her to find another way to keep protecting Madoka and punishing herself. She hates them for that, for failing to hate her as she hates herself. In her new world, she expresses her hatred by passive-aggressively mocking its targets. She breaks a teacup behind Mami. She taunts Sayaka as her memories decay, mimicking Sayaka’s loss of self when she became a witch. She tricks Kyoko into wasting food. And, in the stinger, she throws herself off a cliff next to a white chair, mirroring Madoka tipping off of it earlier. Her hatred for herself has not changed. All that has changed is that now she has the power to make the magical girls hate her, to position herself as their enemy in the hopes that they will finish the job. Ever since the movie aired, there has been debate over Homura’s new status. Is she hero or villain? Here, then, is the answer to that question: Yes. Homura is both the villain of Rebellion and the hero battling that villain. And here, also, is the answer to that question: No. Homura is the villain’s victim, whom the hero must rescue. Her witch’s barrier expanded to encompass the universe. She is the entire story, now. Next week will be the final post of The Very Soil. If we are to look for such a figure of hubris in Rebellion, Kyubey is pretty clearly that figure. He explicitly states that his goal in placing Homura within the barrier is to “interfere with”–that is, control and usurp–Madoka, who created the present universe, and as a result he is furiously punished by Madoka’s herald Homura for his crimes. The result is a new universe in which, the stinger seems to imply, Kyubey’s power has been almost completely stripped by the presence of Homura as an active and engaged demiurge. There is another read available, however, if we look at one of the most famous “fanfiction” versions of Lucifer, Paradise Lost. In discussing Milton’s epic poem, however, it is important first to understand what an epic poem is. Understood cladistically, we can view the epic as a genre mostly descended from the works of Homer; the usual definition provides a list of common generic traits in terms of subject matter and structure, of which the most important for our purposes are that it involves events occurring on a national, cosmic, or global scale; follows the exploits of a larger-than-life, often supernaturally empowered hero; and utilizes a distinctive style that elevates it above normal discourse. In addition, epics usually start with an invocation and declaration of theme, begin in medias res, and contain lengthy monologues, often at least one flashing back to describe events prior to the opening. These contradictions have the effect of making Satan a morally ambiguous figure in a sense–he is structurally heroic but diegetically villainous, essentially. But what does this have to do with Rebellion? Well, consider: Rebellion opens with an invocation of the Law of Cycles and a statement of theme, the cycle of despair in an irredeemable world and the escape into oblivion. We are then dropped into the middle of a situation that does not follow from the end of the series at all, forced to wait until some lengthy exposition by Kyubey much later in the movie to find out what happened to create this circumstance. That our heroine is supernaturally empowered goes almost without saying, as she is a magical girl–but she is empowered beyond that by her status as the witch in whose labyrinth the action of the series takes place, and then later by her love, which transforms her into a demon. In the process, she expands the story to be cosmic in scope. And as for a distinctive style that elevates it above the normal discourse of film, well, see my first post on Rebellion. So Rebellion is an epic. But more than that, it is the epic of how Homura went from being Madoka’s “very best friend” in Episode 12 to calling her an enemy at the end of this movie. It is the epic, in other words, about how the closest and most loyal follower of the closest thing Madoka has to a goddess fell to become a demon, and at the same time conquered the material universe with the stated intent of shepherding it to its destruction–yet throughout, remains a morally ambiguous figure, such that debates still rage across Internet fora as to her moral status. Just as the series is not merely about a Faustian bargain, but actually in many ways retraces the story of Goethe’s Faust, including some fairly obscure elements such as time travel, so too is Rebellion more than just a hubristic fall; structurally and in its juxtaposition of the epic hero with the moral fall, it resembles Paradise Lost. Ah, young love. Isn’t it a beautiful thing? At the end of Madoka Magica, Madoka ascends to a higher plane of being, sacrificing not only her life but her entire existence to save the other magical girls from becoming witches. As becomes clear from both Homura’s explanation to Kyubey in the final episode of the series and comments by Nagisa and Sayaka in Rebellion, the magical girls so rescued continue existing in some form outside the universe, with Madoka. Whatever form they are in, we know they are in some sense aware and able to make decisions, and it appears are simultaneously magical girls and witches (which, of course, they always were). That this is presented, within the series and initially within Rebellion, as a positive development and more-or-less happy ending is perhaps puzzling. Arguably the entire point of Sayaka’s character arc was coming to realize that it was a mistake to try to sacrifice herself to save another, while Homura’s attempts to save Madoka were similarly depicted as making things continually worse for them both. It is not particularly surprising, then, that Rebellion calls that salvation into question. The first segment of the movie, in which the magical girls are happy and get along, and the opponents they face are challenging but conquerable, serves as a parody of both worlds that can be understood as “Madoka’s world.” As a new enemy representing human misery, the Nightmares are a twisted reflection of the Wraiths. Like the Wraiths, the Nightmares are oddly similar to one another, but where the Wraiths are fairly creepy, attenuated humanoid giants, the Nightmares wear bear suits and fire stuffed animals from their arms. Defeating a Wraith earned many small rewards for cleaning the magical girls, Soul Gems, making magical girl teams viable, unlike in the prior, witch-infested timelines). But in Homura’s fantasy world, defeating a Nightmare creates a diffuse glow that purifies the Soul Gems, making magical girl teams actively preferable to intercept more of that light. 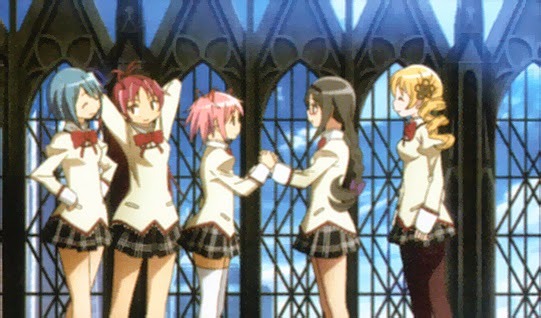 In addition, where the first we see of the Wraith world created by Madoka is the death of Sayaka and mourning of her teammates, Homura’s dream world preserves both Sayaka’s life and her wish, by pairing (or at least heavily implying a pairing) her with Kyoko to allow Hitomi and Kyosuke to be together. Homura’s fantasy world is, simply, happier than the one Madoka created! It is also sillier, and not just because of the bear suits. The juxtaposition of the mundane and the eerie is the province of surrealist art, and it is here that the Wraiths, and by extension the city they haunt, largely fall. Faceless men are, for instance, a favored subject of Magritte. Likewise, the witches, though more playful, are juxtaposed with extreme violence, both by the witches against humans and magical girls, and by magical girls against the witches. This combination of playful, often childish, imagery and violence forms a sort of brutalist surrealism. There is, however, no violence against the Nightmares. They destroy property, seemingly, but there is no trace of damage when the magical girls are done, and against them the magical girls will deploy traps and bindings or fire weapons to drive the Nightmare into a trap, but never attack the Nightmare directly. The actual defeat of the Nightmare seems to involve actions that are at once highly ritualized, yet seemingly arbitrary–a banquet catered by the magical girls in the cold open, and a nursery rhyme-like chant or game about food against Hitomi’s Nightmare. Meals, food, nursery rhymes, games, the nursery–these are all common features of nonsense literature, most famously the Alice books. At the core of nonsense is an interest in alternative logics, in circumstances (such as games, meals, etiquette) where ultimately arbitrary, yet internally consistent, rules guide behavior; like a dream, nonsense substitutes one set of arbitrary rules for another, and lets the consequences play out logically. And yet within this nonsense, all five magical girls are alive and happy and thriving; it seems, a world of nonsense is better than the world of Wraiths Madoka created. Madoka’s “pure land,” her heaven, is also depicted inferior. As I have argued at length elsewhere, Madoka’s “afterlife” is inferior to even Homura’s dream world because it is a deathless world that contains no decay, no suffering, no putrefaction; both Sayaka and Nagisa chose to reify themselves alongside Madoka because they sought something that only existed as a consequence of decay and death, namely Sayaka’s relationship with Kyoko and, for Nagisa, cheese. Homura’s dream world is also more directly a parody of Madoka’s “heaven,” in the sense that Homura snatched magical girls (as well as at least five, possibly six ordinary humans) into her world without their consent and now keeps them there, trapped and cut off from the universe, but artificially happy. She has “saved” them because she has grown to care about them by extension, as the people Madoka loved–and at least in the case of Kyoko and Mami, whom she ultimately trusts to kill Homulilly, come to respect and possibly even like, as well. To want to save someone is necessarily to want power over that someone. By becoming a knight protector, Sayaka made herself a judge (and in the case of those two misogynists on the train, likely executioner as well). By wishing to be the one to protect Madoka, Homura ultimately put herself I a position to repeatedly try to take the choice of becoming a magical girl away from Madoka. And by wishing to save all magical girls from their destiny of becoming what they fight, Madoka set herself up as a goddess. To be a savior (as always, as opposed to helping, which involves the consent of the one helped and places the helper in a temporarily subordinate, rather than dominant, position), in other words, necessarily entails being a little bit of the tyrant. Since the savior is acting without the consent of the saved, they are very likely to get it wrong, as Madoka does with Homura. Look at the opening credits: Homura is depicted as a grey, troll-like figure lurking while the magical girls dance. She is not capable of joining their happiness; the closest she is able to come is as the weak and shy “pigtails” version of her character during the first segment of the movie, and even then she is able to sense that something is deeply wrong. Once her hair is again loose, she is never genuinely happy again for the rest of the movie, for the simple reason that her untold ages of suffering, and the fact that she and she alone remembers them, have warped her emotionally to the point that she very possibly cannot be saved. Instead, she acts in parody of Madoka, snatching people up and placing them in her labyrinth. But is it really any different from what Madoka did? Is Madoka’s sacrifice an act of selfless love while Homura’s is selfish? And which is the greater sacrifice–your existence or your soul? Is it worse to never have existed, or to become the enemy of all you once held dear? The answer, of course, is that it’s a silly question. All value is relative, so it is entirely a matter of perspective which is worse; very likely, each of the two girls feels their own sacrifice is the greatest they could make, since Madoka cares deeply about her connections to others, while Homura is more focused on her cause. But, seeing in Homura’s actions a twisted reflection of Madoka’s, we see Madoka’s in a new way as well. Can an act truly be considered selfless if it gets you everything you ever wanted? Madoka gets to be with, in her own words, “everyone”; all her loved ones are safe; she gets to defeat all the witches; she gets to become a magical girl; she gets to matter, quite possibly more than anyone else who ever lived. By contrast, Homura’s choice to become a “demon” devoted to keeping Madoka in the world costs her the only thing she values, the chance to be together with Madoka in the end; now they must eventually be enemies. Isn’t it therefore Homura who is selfless? Of course not, because selfless love is an oxymoron. That is the point in depicting Homura’s possessiveness, and through it revealing Madoka’s selfishness. To love someone is to want to protect that person, possibly from themselves. It is to want to spend time with that person. It is to want that person to want you. Expressed in a healthy way and reciprocated equally, of course, love can be a wonderful thing; romantic or otherwise, it is the ultimate bond between two people. But like any bond, it can be use to entrap, to control, to assert dominance. It is no accident that the people most likely to claim that “pure,” “selfless,” “giving” love is better than the messy, reciprocated, collaborative love of an actual relationship are such upstanding members of society as moe fanboys, people with Nice Guy Syndrome, and authors of “Christian” purity-culture marriage handbooks that read like guides to creating an abusive relationship. So, of course, Homura sees no way to wish for what she truly desires, to be with Madoka. She wishes instead to take care of Madoka, first in the series at the end of the “original” timeline shown in the first part of Episode 10, and then in Rebellion when she becomes a “demon.” In both cases, she ultimately sees no hope but to become “evil.” Rebellion thus closes the largest cycle in a series full of cycles: the evolution of Homura Akemi from a dark, seemingly villainous character who disrupts the status quo to a dark, seemingly villainous character who maintains the status quo. More than ever, she is now Mami’s dark mirror. Also: Why is it snowing in May? Madoka the Movie 3: Rebellion is a difficult subject to approach. Like the series, it is semiotically dense (that is, the images and events it contains evoke a relatively high number of readings); however, where the series primarily takes place in fairly stark, sparse, almost sterile environments, to contrast the visual complexity of the witch’s labyrinths, the movie is tremendously visually complex throughout. In other words, not only does each image have as much to unpack as any image in the series, it’s also got quite a bit more imagery than its five-and-a-half episodes’ worth of runtime would suggest! Analyzing it is thus a potentially overwhelming task. To take the movie as an organic whole is nigh-impossible, at least in anything like essay length; to do it justice, one must either pick a theme and follow its development through the film, missing out on all the other themes except perhaps for how they interact with the chosen theme, or one can pick a scene and examine it in all its complexities, missing out on all other scenes except insofar as they impact the chosen scene. Consider a relatively straightforward question: What is the titular rebellion? Is it Kyubey against Madoka’s new world? Homura against the world inside the labyrinth, unaware that she herself created it? Is it Homura against Madoka? Or is the film itself an act of rebellion, and if so, who or what is it rebelling against? Even a question as seemingly simple as “What does the title mean?” leads only to more questions, and there are a multitude of supportable answers to each of them, each of which could fill an essay in its own right. Thus, in the coming weeks I will be posting a series of essays on Rebellion. Some may be analyses of single scenes; others may trace themes or look at the evolution of a character. All, however, will be explorations of a particular answer to the question, “Against what?” Such an approach seems to me the only viable way in which I can approach Rebellion, as this is a film that defies analysis. And a near-synonym for defiance is… well, you get the idea. So, then, let us consider a particular short scene that exemplifies how difficult this film is to analyze, specifically, the final post-credits stinger. Immediately prior to the stinger, the credits themselves depict a heavily stylized version of the movie’s plot, with Homura and Madoka divided by the credit scroll itself. At the very end of the credits, however, they hold hands and run off together into the distance, a surprisingly hopeful end to the story given Homura’s posturing in the final scenes before the credits. Is this foreshadowing, or just Homura’s dream? Is the fact that they vanish into the distance evidence that they will escape, or evidence that the possibility of them being together is disappearing? It doesn’t matter, because the stinger contradicts the image anyway. (Or does it? If the credits are Homura’s dream and the stinger the reality, or the credits are foreshadowing and the stinger her fears…) It’s worth, here, examining the usual function of a stinger. Most commonly found in big blockbuster action franchises (the Marvel Cinematic Universe has raised them to an art form) or comedies, the usual function of a stinger is either to serve as a punchline to a joke set up earlier in the film (possibly the best example of this is the taxi passenger in Airplane!) or to build excitement for and drop hints regarding the plot of the next installment in the franchise (Samuel L. Jackson would like to talk to you about the Avengers Initiative). Here, however, the stinger’s function appears to be neither. Rather, its main function appears to generate questions and cast doubt on the way Homura chose to present herself in the final scenes. Admittedly, it is a “punchline” in the sense of concluding a repeated motif throughout the Madoka movies, specifically the two chairs in a field. In the opening credits of the two compilation movies, we see Madoka and Homura sitting side-by-side on white chairs in the middle of a field of grass and flowers, cuddling playfully. In the Rebellion stinger, Homura begins sitting in a similar chair, alone, positioned on the edge of a cliff. 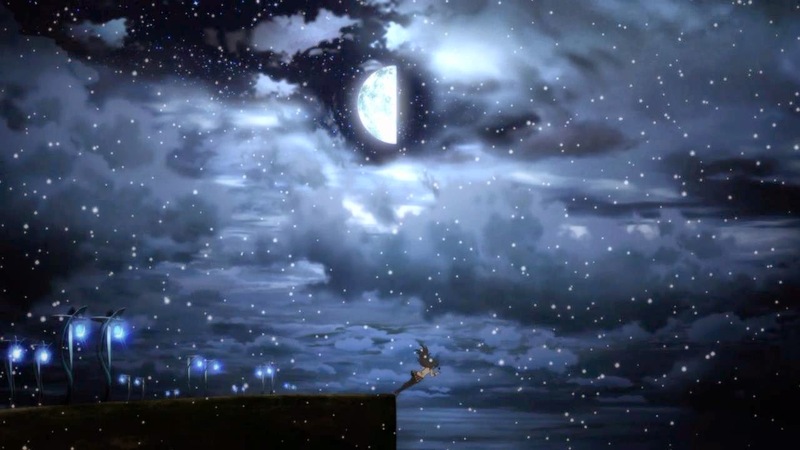 Chair, cliff, and half moon are lined up to create the effect of a picture sliced in two, as if the other half of the moon and the other half of the world, including Madoka and her chair, have been simply cut away and replaced with empty darkness. Is this Homura’s decision to make even Madoka her enemy? Her regret? Or just a cruel reminder for the audience of what has been lost? Homura, in the final scenes of the movie, appears to be in total control. An army of familiars obey her; she can rewrite Sayaka’s memories and cut her off from her Oktavia form; she can block Madoka from her Buddha-nature, the Law of Cycles. She is the creator of this new world, having rewritten reality earlier in the movie; it is not too far-fetched to suggest that she is now the most powerful entity within the confines of the universe (it is up for grabs how she compares to the Law of Cycles). Why, then, does she appear startled by the approach of Kyubey in the stinger? The expression on her face is readable as either apprehension or hope; given the associations of the chair, does she momentarily believe it’s Madoka? Does she hope it is, or fear that it is? How can she not know that it’s Kyubey? And then there is Kyubey’s state: disheveled, trembling. 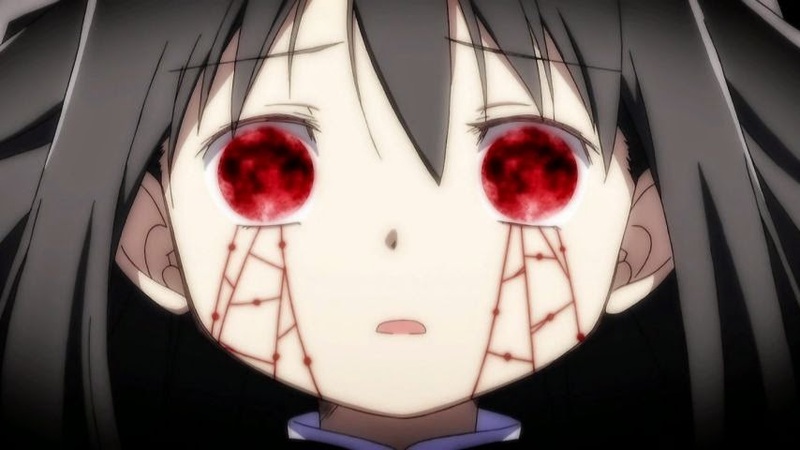 Extreme close-ups on Kyubey’s eye were frequently used in the series to remind the viewer that he is watching, and they thus served to make him a more ominous and menacing figure. This close-up, however, shows his fur matted, his eye dulled and darkened and shaking. He is no longer a menacing figure but a pathetic one, beaten and broken by Homura’s display of power in rewriting the universe. This is a worst-case scenario for him and his kind; Madoka came to fear and distrust him, but she has little capacity for hate. Homura is different; full of rage and sorrow, it would not be at all out of character for her to take that out on the Incubators in general and the instance of Kyubey in Mitakihara in specific. But the logic of the stinger suggests that the extreme close-up of Kyubey’s eye is foreshadowing–it is the most typically stinger-like of any shot in this stinger, reminiscent of horror movies ending with the believed-dead killer’s eyes snapping open. Unfortunately, he is as inscrutable as ever; is he plotting a counterstroke against Homura? Simply observing and biding his time? Or is he truly broken, his pathetic appearance evidence that his role as villain has been stripped from him by Homura? And then there is the dance. Homura dances with her new Soul Gem, both the style and music reminiscent of her balletic transformation sequence near the beginning of the movie. The gem resembles the chess symbol for a queen; is this Homura imagining herself dancing with her queen, Madoka? This reading is supported by the fact that the Soul Gem was made from the pieces of Homura’s old Soul Gem and a spool of thread the same color as Madoka’s hair, but only if we read that thread as signifying Madoka herself or her connection to Homura, as opposed to the equally likely reading that it represents Madoka-the-incarnate-person’s connection to Madoka-the-omnipresent-intangible-abstraction, in which case Homura is not so much missing her “other half” as reveling in her imprisonment. It is the difference, in other words, between reading Homura as putting on a bold face over confusion and pain, or as a creepy, controlling stalker. And then Homura tips sideways over the cliff. Her pose as she falls recalls Madoka’s similar sideways tip off her chair when Homura becomes a witch, which seems fairly clearly to be a reference to Madoka’s self-sacrifice and Homura’s growing regret at failing to stop her. So is Homura seeking to join Madoka by replicating her action? Sacrificing herself so that Madoka doesn’t have to? Mocking Madoka’s sacrifice as a signifier that she has descended so far into evil even the love that motivated her no longer matters? 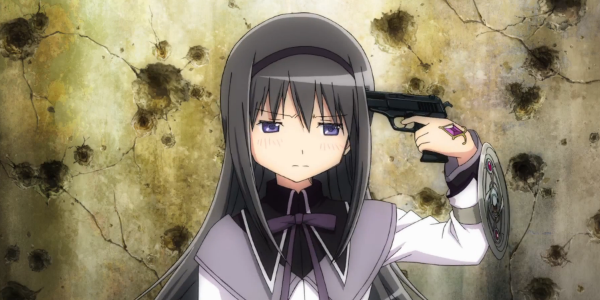 Or is it a futile gesture toward an impossible suicide (it is unclear what would happen to the universe if Homura died, but virtually certain that at least Madoka would reconnect with the Buddha-nature Homura is determined to keep her from) by a character in the depths of despair? We could explore these questions in detail, certainly, along with other questions (for example, the significance of the moon being precisely halfway between the almost-new moon when Sayaka became a witch and the full moon when Homura became one). It would take thousands of words and produce no certain conclusion except that the scene is deliberately ambiguous, but it can be done. That’s not the point. The point is that this is ninety seconds of a two-hour movie, and not even the visually or semiotically densest ninety seconds (those, I suspect, fall somewhere between Homura witching out and she and Madoka shattering the Incubators’ barrier). No, the point is this: This movie is dense, and it is ambiguous, and it thus poses a challenge to analysis. Good. Let’s do it anyway. The OTHER trick I pulled in the article on Episode 10. The Very Soil will resume next week, but only if you tell me I’m clever. P.S. : There is going to be a book version. The book will contain revised articles and also new articles, much like the My Little Po-Mo books. I have no release date, even an approximate one. Edit: Happy Walpurgisnacht! Too bad I didn’t think to time the articles so that one of the last two eps fell on today. In the final episode of Madoka Magica, failure is victory is loss is triumph. We open with the same tableau that ended the previous episode. Four figures remain, the key players in this apocalypse, for apocalypse it is: Every timeline we have seen has ended with a fight against Walpurgisnacht. There is nothing beyond the fight with her, because Homura keeps resetting the universe before the future can occur. Homura is the first figure, broken and bleeding, the sad clown who is endlessly victimized by her desperate attempts to find meaning in an absurd and uncaring universe. Laughing at her mockingly is the instrument of her defeat, Walpirgisnacht, the harlequin who signifies that absurdity. Between them is Kyubey, the director, author, orchestrator, the master manipulator who choreographs their dance to please his unseen audience and thus derive power and sustenance from their emotional arcs. But then there is Madoka. She has been inert, the prize the others fight over, but now at last she makes her choice. And what a choice it is: death. She will become death, the destroyer of worlds, slaying all witches at the moment of their birth, until ultimately there are none left but she herself, and then she will kill herself. But Madoka is not Sayaka. This is not suicide; this is the transcendent death, the death of the ego that gives access to eternity and unity. There is no more Madoka; she is an existence without beginning or end, and within her all things are one. First, however, a long-promised cake. That was the agreement between he and Mami, after all: that if Madoka could find nothing to wish for, they would share a cake. But Madoka just made her wish; why cake with Mami? Because Madoka has solved the paradox. To become enlightened, to escape the karmic cycle of hope and despair in which the magical girls are trapped, one must shed all desire. But if one sheds all desire, including the desire to transcend, why would anyone transcend? Madoka has found the answer: the death of ego, the erasure of the self-other distinction, which eliminates desire because the subject doing the desiring and the object of the desire are one and the same. “If you meet the Buddha in the road, kill him.” Though she made the wish only moments ago (insofar as that concept can mean anything now that she exists equally throughout all of time), she no longer has any wishes, so she receives enlightenment and cake. There is more to this scene than cake, however. Madoka is handed back her notebook of costume designs by Mami, the protector and signifier of the traditional magical girl show. When Mami died, Madoka stopped talking about becoming a magical girl as a way to find purpose; instead, it became a sacrifice she repeatedly considered making for the good of others. By returning the notebook, Mami is symbolically passing the role of guardian of the magical girl tradition to Madoka, while at the same time restoring the idea that being a magical girl can be a calling rather than a sacrifice. Because one thing Madoka most definitely is not, is a martyr. She is not a Christ-figure, suffering and dying as a way of absorbing the sins of others; she explicitly destroys the witch-aspect of herself which carries that suffering. She is egoless and transcendent, and thus cannot suffer. Her role in this Faustian take is that of Gretchen, and as such she is more of a Marian figure, pure and unsullied, interceding to obtain a state of grace for others. Except even that is not quite accurate, because Madoka doesn’t intercede or plead mercy for the magical girls. They still become witches and die; the only change is that their witch-forms do not exist in this world, because Madoka erases them at the moment of creation. They still suffer and still despair, still die–but such is the nature of living in this world. Madoka’s role is as guide and teacher, a psychopomp who carries the magical girls out of the world before they can become a problem for it. With her in her pure land, they learn, and perhaps someday transcend as she has. Meanwhile, on Earth, things are imperfect, but better. “Daijobu.” “It will be all right.” This is what Madoka tells Homura just before she appears in the final form variously dubbed Madokami or Godoka by fans (though Madokannon would be more appropriate, as she is more Bodshisattva than divinity). It is a powerful phrase in the iconographic roots of the show; in.Cardcaptor Sakura it was the ultimate spell the hroine created at the end of the series, an expression of hope of nigh-limitless power. Madoka is already carrying out her duties as the warden and guardian and magical girls past. At the same time, however, her transformation sequence is brief, unsexualized, and strongly implies her costume to be made from an Anthony–the familiars that dominated the witch’s labyrinth in the first episode, the first instance of the strange and wild new aesthetic the show introduced. Madoka is becoming a bridge between the old genre and the new. She speaks the assurances of the old genre to the representative of the new one. She gives her ribbons–chosen for her by Junko, who has repeatedly been paralleled to Mami–to Homura as well. It is not a complete restoration of the magical girl tradition–the new world is still dark, and being a magical girl is fraught with dangers and likely to end with death–but a partial restoration, acknowledging that there were good stories, good characters, and true themes to be found among magical girl shows past. Chief among those themes is hope. Naïve hope, the optimistic belief that things will get better, is a trap, yes. Anyone sitting around and waiting for a savior or a lucky break is doomed to disappointment. It is the nature of an entropic universe that if things can get worse, they will, and things can always get worse. But there is another form of hope, the hope embraced in the end by Homura: if things can and will get worse, that necessarily means that at this moment, the universe is not at maximum awfulness; there must be something good in the world right now. That good can be sought out. It can be fought for, preserved for a little while. Entropy can be reversed locally. Madoka has attained enlightenment and divorced herself from this decaying world. But she has not abandoned it; the world she creates is better. Not perfect, because a perfect world is a world devoid of story, but better. The magical girls still inevitably die, but so does everyone else; what’s important is that they now have a far better idea of how the system works and a much better relationship with each other and the Incubators–notably, the fact that wraiths drop a number of little magic-restoratives rather than one big one encourages the magical girls to work together. Teams are likely the norm in this new world, rather than solitary girls as in the old world, and since the Incubators can no longer derive energy from the despair of the witches, they have no incentive to make the girls suffer or hide from them how the system works. Even Junko is shown in a new environment. We have seen her driven and determined before, concerned, caring, but this final sequence is the first time that we see her being happy. Some have interpreted this scene as Junko being a very different person in the new timeline, less driven and more nostalgic, but there’s little reason to believe this is the case. It seems highly unlikely Madoka would replace her mother with a different woman, and far more likely that this is what Junko is like when she’s relaxing and having a day out with her family. Her dynamic with Madoka’s father is unchanged–he cares for Tetsuya while Junko deals with the outside world, in this case talking to Homura–and so it is likely that she is still the primary earner, the driven executive. It is simply that we can now see that she also contains within herself nostalgia and serenity and wistfulness; she contains contradictions, just as the magical girls/witches contain both curses and blessings, as this ending is both happy and sad, a win and a loss. Seeing Junko and Tetsuya helps Homura to understand that there can be good things in what for her is a dark, Madoka-less world. She continues on, affirmed in her knowledge that Madoka is all around her, even if she cannot see her. She does not fight for hope in the normal sense, but out of love, and duty, and hope in the Havelian sense that whether or not she succeeds, her life makes sense as long as she fights. And so she fails to save Madoka, and in her failure succeeds in empowering Madoka to save herself. Madoka saves herself by sacrificing herself, and Homura loses her–but someday, when Homura expends the last of her energy and loses her last battle as a magical girl, she will be together with Madoka again. But this is not for Homura alone. Someone else has been working, trying to stave off decay, but increasingly concerned that their efforts are doomed. “I am full of hatred toward men’s so-called happiness,” Urobuchi wrote in the afterward to Fate/Zero volume 1, “and had to push characters I poured my heart out to create into the abyss of tragedy… In order to write a perfect ending for a story you have to twist the laws of cause and effect, reverse black and white, and even possess a power to move in the opposite direction from the rule of the universe.” The implied author of that note and this series is a deeply depressed individual, spiraling into a creative abyss brought on by despair. “Only a heavenly and chaste soul that can sing carols of praise towards humanity can save the story.” And now, in Madoka, all things are one. This is fiction, a creation within the mind of an author (even the gestalt implied author of a collaboration); the author is that one. Madoka loved something in the world enough to deem it worth saving, and she is part of that author. Homura will accept that love as reason enough to keep moving and working, and she is part of that author. Just as Homura is not suddenly all smiles and laughs in the new world, this is not a panacea–but it is enough to keep going for a while longer. –Don’t forget. Always, somewhere, someone is fighting for you. –As long as you remember her, you are not alone. The projector winds to a stop. There will be a brief hiatus, followed by the first of several posts on Rebellion. Sorry this is so ridiculously late. I just COULD NOT WRITE last night, which meant I had to do this during lunch and bathroom breaks and such at work. Also, this one proved to be a struggle to write, because there is SO MUCH happening in these final episodes. We begin at the end, with the wheel of fate. It is everywhere in this episode. The great grinding gears of Walpirgisnacht are the cycles of hope and despair that transform the magical girls (back) into witches, and they are the endless cycles of reset time Homura creates. Both are the wheel of fate, as is the round clockwork buckler Homura uses to travel in time. At the far end of the episode from them, Kyubey explains that Homura created Madoka. With every rebirth, Madoka carries the karmic burdens of the previous cycle into the next. In the Classic Buddhist explanation of rebirth, it is like lighting one candle with another; nothing of the candle is passed on, but the flame, the flame is the same. (That Homura’s name means “flame” is no accident.) 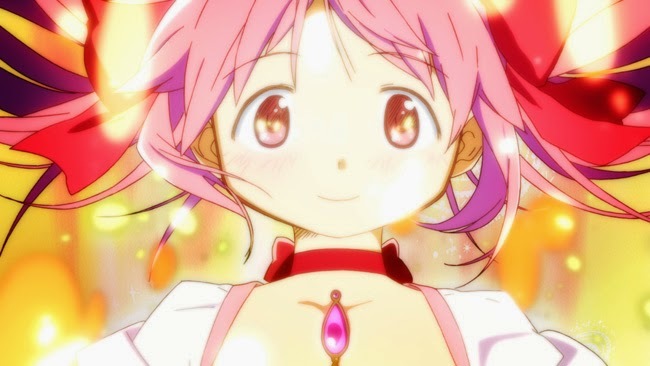 In other words, though Madoka carries no concrete memories from time to time, only a few vague impressions no doubt arising from her deep connections to the one person who does remember previous timelines, and though she is physically recreated in each timeline, she still maintains the connections to the world of the previous timeline. And since these worlds are being created and destroyed for her, it is the weight of the entire world she carries. And it is a weight. In the end, these connections to a world hurtling headlong to destruction can lead only to suffering. The rising entropy of the world feeds into Madoka, transforming her in successive timelines from an inexperienced, but outgoing and confident, magical girl to an uncertain and unpowered sidekick whose associated heroines keep dying. And why does this happen? Because Homura tried to protect her. Homura is a Christian (or, at least, attended a Christian school). Like Kyoko, she has absorbed the belief that it is possible for one person to save another–that there is something to be saved from, and somewhere to be saved to. It is a fundamentally dualistic proposition–here is bad, but there is good. But as Kyubey has made clear, we are in a Buddhist world. What both Kyubey and Homura have failed to understand is that in a Buddhist universe, the decay of the material world is an illusion because all binaries are illusions. The past is the present is the future. Decay is life. Magical girls are witches. The material is immaterial, and the other is the self. 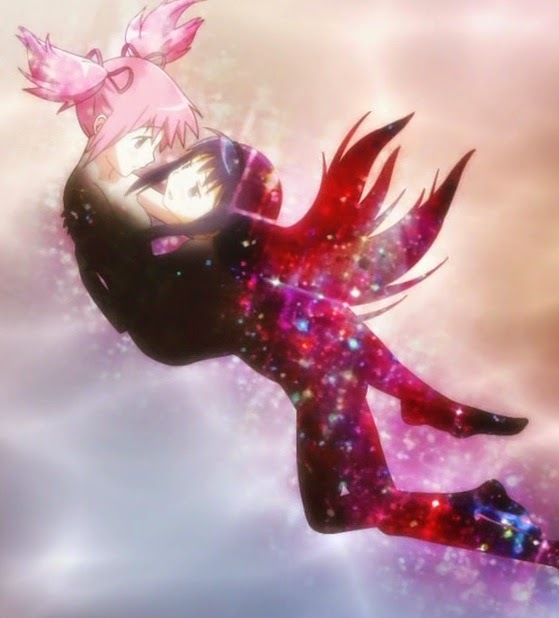 Homura cannot save Madoka because there is no Madoka to save and nothing from which to save her. All things are One–and since this is a fictional story, that One is the narrative itself, and in turn the gestalt entity within which that narrative exists, the implied author. We no longer have a Mami to contrast with Homura, but we do have the woman who kept being paralleled to Mami in the early episodes, Junko, who has two very important scenes in this episode. In the first, she discusses Sayaka’s disappearance and its effect on Madoka with Madoka’s English teacher. In this scene, she seems to parallel Sayaka more than Mami: she is gently chastened for her inability to stand by and do nothing, for insisting on doing rather than being, and a shot from the teacher’s point of view is bathed in blue light and framed to focus on her hair clip, with the result that she even looks like Sayaka. Hovering above Junko throughout the conversation with Madoka’s teacher is a reproduction of Michelangelo’s The Creation of Adam. Notably, the position of the two characters aligns Junko with God and the teacher with Adam; at the same time, the red lighting on the teacher’s side and blue lighting on Junko’s causes God’s red mantle (which has been compared by scholars to both a uterus and a brain) to be barely visible; it is instead Adam who appears wrapped safely in red warmth. This image foreshadows Junko’s second scene in the episode, in the shelter, when she realizes that she has to stop protecting Madoka and start trusting her. It is a tragic scene, culminating in possibly the single densest shot in the series, a simple image of Junko’s mom-jeans-and-sweater-clad crotch, lower abdomen, and hand, Madoka’s mother reduced to a womb. The hand reaches out as if to grab Madoka, pull her inside–and then stops, and we cut back to Junko’s face. The woman will not be idealized (read: reduced and objectified) as a mother; she overrides her own mothering tendency and makes the active choice not to act, to allow Madoka to risk the life Madoka owns. Watching, we feel Junko’s pain as she lets go, but we also feel the profound respect and trust she is showing toward her daughter. But Homura has been doing the opposite, pursuing a Christian ideal of salvation, in which the higher protects the lower, a permanent womb. She is trying to block Madoka from choosing the self-sacrifice she knows Madoka would make; if Junko is showing respect and trust toward Madoka, what is Homura showing towards her? The answer, as of all people the supposedly unempathic and unemotional Kyubey notes (revealing once again that he has plenty of intellectual empathy, just no emotional empathy, a not entirely inaccurate first-order description of a sociopath), is that it has long ago ceased to be about Madoka. Homura herself described her journey to protect Madoka as a labyrinth, and the inside of her apartment resembles nothing so much as the surreal interior of a witch’s labyrinth. Extradiegetically, magical girls began as witches; diegetically, they all end as witches. Homura can transcend time. In Homura, all things are one, the past, present, and future become a single wheel. She is, in other words, both magical girl and witch, trapped in a labyrinth that is the narrative of the series itself. In that role as magical girl/witch, she brings both wishes and curses, at once protecting Madoka and ensuring her destruction. But what transforms a magical girl into a witch is the transition from hope to despair, from the optimism that things will work out to the realization that death and decay are inevitable and inescapable, and Homura has never experienced that transition. Homura has never had hope. She was a weak and sickly child who became a magical girl out of desperation and a sense of duty, wishing to become not Madoka’s savior but her protector. Even in her wishes, she does not imagine that she will actually succeed, only that she will try. She is entirely and innately hopeless, and as such she is immune to despair–because like all other binaries, hope and despair are one. Thus it is not hopelessness that finally breaks Homura; rather, the realization that she is making things worse causes her to doubt her path for the very first time. For her, it is the transition from determination to doubt that threatens to bring about her transformation. And there laughing at her is Walpurgisnacht, the witches’ Sabbath, the wheel of fate, the Harlequin. In the old commedia dell’arte, the Harlequin is a trickster figure, mocking all authority and order, and competing with the stern, sad Pierrot for possession of the beautiful Colombina. Like the Harlequin, Walpurgisnacht will dance forever with Homura, laughing at her and snatching away Madoka, her Colombina, defying rules or containment, a living symbol of the irreducible unpredictability and chaos of life. There is no higher and lower in the face of a trickster, only people. Rules are broken. Systems come crashing down. And it is in this moment that Madoka arrives to make her wish.